News Reporting and Writing 11 Edition As media evolve and new formats emerge, journalism students face new challenges and need new advice. 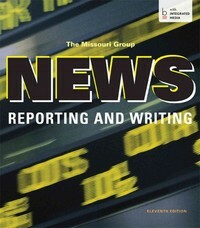 The Missouri Group confronts these issues in the new edition of News Reporting and Writing, teaching students how to work in the new world of digital journalism by using the enduring skills and current savvy that all reporters need. With new annotated models tracking a story across multiple electronic formats, expanded coverage of writing for digital media, and integrated video clips that go beyond the printed book, News Reporting and Writing will leave students better-prepared than ever.